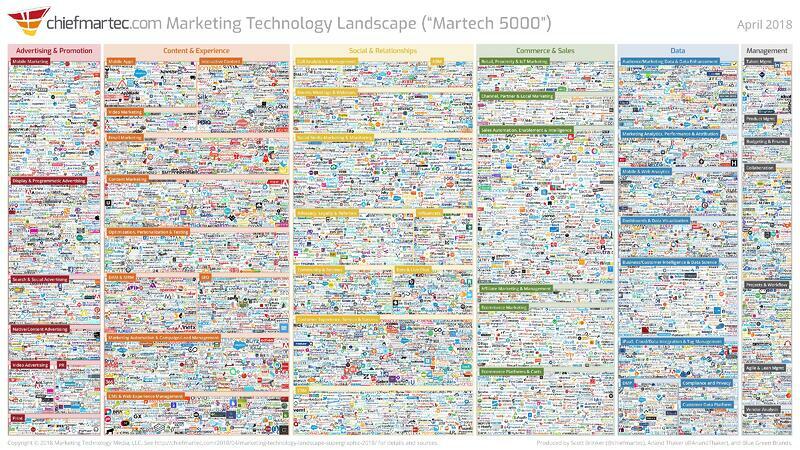 How stacked is your marketing technology? Marketing technology is now essential to any successful marketing campaign, and will only grow in importance as data becomes more important to marketers. However, even as a seasoned marketer, you may have trouble building a stack and leveraging it to remain agile in an ever-changing market. 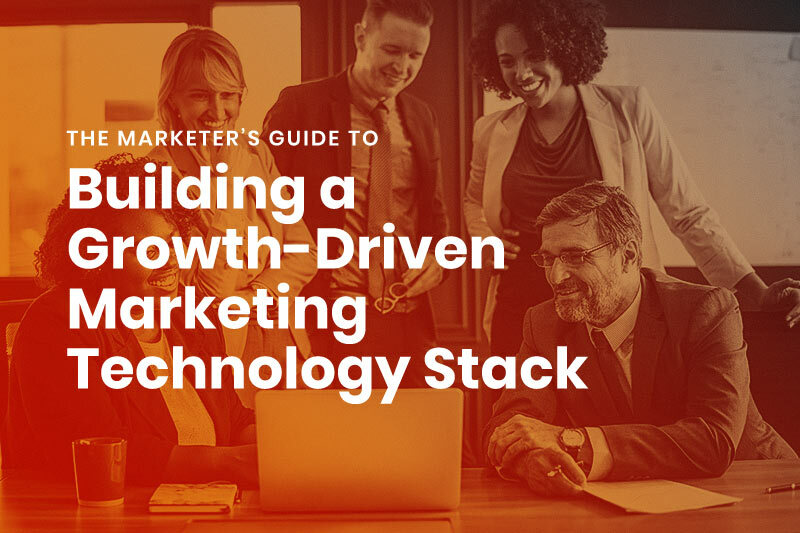 The key to finding the right martech stack to use within your organization begins with understanding the needs of your employees, and what you need to support your company goals of acquiring, converting, and retaining customers. What is Growth-Driven Marketing Technology (Martech)? Track interactions with individual customers, offering your business granular information that can be key to personalizing your business experience. Create personalized buying experiences, which can drive down the cost of acquisition for new customers and help to boost conversion and retention rates. Track key metrics for everything from the bounce rate of your website to what percentage of your mailing list opened the last e-mail you sent. Martech is a field with seemingly endless potential for growth which are just now being explored. Applications of it exist for marketing automation, e-mail marketing, social media outreach, video advertising, workflow management and more. However, you only need a handful of martech solutions to build a stack which allows you to effectively reach new customers, strengthen relationships with your current customers,and ultimately grow your company. Speak to an expert to learn how inbound marketing and the right martech along with proven strategies can 10X the growth of your business. Once you learn how to build the marketing technology stack that works for your organization, you can get the best return on your investment. A marketing technology stack is simply an integrated collection of martech tools which allow marketers to improve customer experience at every touch point with their organization. A martech stack includes a wide range of capabilities which can help to increase the amount of data you can collect from your interactions with customers. A fully-integrated marketing stack can allow you to obtain a top-down view of your entire sales process while aligning data collection with the needs of your sales team. Annuitas Group reported that a marketing stack can improve marketing efforts by increasing the amount of qualified leads your business obtains by 451%. A martech stack will give your organization the capability to reach potential customers across a variety of channels while gathering data to refine outreach. Your stack will differ based on your particular needs and whether you are a B2C or B2B business. However, every stack will have a few common components that allow businesses to automate key tasks while gathering information about your interactions with potential customers. Perhaps the most important trend in marketing right now is the growing importance of data, including its collection and analysis, at every point of contact with a customer. In two recent studies by Adobe and Forrester Consulting which involved 518 marketing executives from all over the world, 44% of respondents said their top priority for martech today was to gain customer insight through data and analytics. Another 43% said they used martech to make better use of data they obtained to improve their current marketing efforts. Scott Brinker of ChiefMartec has tracked the growth of martech companies for the past several years and published them in a helpful, annually-updated infographic (shown above), "Marketing Technology Landscape." Today's customers have more power than ever before, and the most effective martech platforms provide information about their preferences, behaviors, consumption patterns, and any other bit of data that could help marketers better reach them. Martech has fast moved from a cutting-edge, experimental technology to an essential component of any marketing team. As video marketing and e-commerce become more important components to marketing campaigns, martech can also help you to leverage them to your advantage. Martech provides marketers with the tools necessary to gather data about past, current and potential customers, and can help to create a meaningful analysis of their behaviors. Martech can provide marketers with a clear picture of the efficacy of their marketing efforts and ways to improve outreach. In addition, martech automates numerous time-consuming tasks, allowing marketers, designers, writers, and others to focus instead on more creative, high-value projects. When deployed effectively, martech can function as a force-multiplier that works across an organization. Another major reason to invest in martech is it is fast becoming an industry standard, and you could be left behind if you fail to keep pace with competitors. Conductor, a popular search engine marketing platform, recently published the results of a November 2017 survey, in which they interviewed 500 top-level marketing executives from all over the globe to get a better idea of the scale of martech adoption. 68 percent of respondents said they intended to invest in more martech in 2018, while 28 percent said they were already spending over six figures a year on it. Conductor also revealed the growing scale of martech adoption. While only ten percent of respondents introduced more than six new technologies in 2017, a full 80 percent of respondents bega to use anywhere from 1 to 5 new technologies. Given that martech has grown exponentially in popularity with marketers over the past seven years, it is possible that many companies will soon transition from a more ad hoc use of martech to full martech stacks. Once marketers can harmonize the various technologies at their disposal, they’ll be able to make full use of their capabilities. If you want to know what makes a great marketing stack in 2018, it helps to know how other marketers are adapting to the new data-driven landscape. In the recent studies by Adobe and Forrester Consulting, 58% of respondents said their use of martech “dramatically increased” over the past few years. A full 57% said they shaped their marketing strategies around data, while 45% reported more spending on technologies that could improve personalization and help them analyze their data. These trends are only expected to continue in the next few years. You have a vast array of technologies to choose from if you are trying to build a martech stack in 2018. It’s easy to feel overwhelmed by all of your options, but every successful marketing stack will need a few key components. For example, you’ll want to choose technologies which help you to better manage your current content and share it with potential customers across a variety of channels. In addition, you’ll want to find ways to automate current outreach processes, such as e-mail marketing campaigns, to free up time for more creative work. Content Management System (CMS): A CMS such as Wordpress or Drupal can host any content your organization creates. Online Advertising: Google Adwords, SEMrush and Wordstream can help you create a strategy for your paid advertisements. Optimization software: Unbounce lets you A/B test, which is important for testing potential changes you wish to implement to your site. E-mail marketing: Mailchimp and Hubspot are two of the most popular automated e-mail marketing providers. Web analytics tools: Google Analytics, Yahoo Web Analytics, and Kissmetrics can help you to monitor your web traffic and discover how to optimize your sites to attract more. Customer relations software (CRM): Salesforce, NetSuite, and hubspot are popular CRM suites which can help you track interactions with leads and customers throughout every stage of the buyer’s journey. Social media management: Facebook Insights, Hootsuite, and Twitalyzer are just a few of the options available to help you manage and optimize your social media presence. Video marketing: Video is becoming more important to advertisers, and companies such as Youtube and Vimeo can easily integrate into your martech stack. Workflow management: Instead of e-mailing your team their daily tasks, you can use a workflow management software program such as Flokzu, Wrike, or Kissflow to keep your team on track. Search Engine Optimization: Google Analytics and Bing Webmaster can help to optimize your website for today’s customers, drawing them into your website while getting the chance to learn about their preferences and the best ways to get their attention. E-commerce: You can integrate e-commerce platforms such as Shopify or Magneto to provide your website with a digital storefront. Mobile marketing: Statistia reports that 50.3% of all web traffic worldwide in 2017 came from mobile phones, and mobile marketing technologies such as Google’s Accelerated Mobile Pages can help you to optimize the web experience your organization offers to any of your on-the-go visitors. According to Pitchbook, a firm which collects data on venture capital and private equity movements, companies spent nearly $2 billion on martech in 2016. It’s tempting to dive right into martech, but it’s helpful if you stop and think about your needs before rushing to buy any. You’ll want to think about what aspects of your business can improve from more data and how best to integrate and analyze the new streams of information you’ll receive. If you don’t, you could spend your advertising budget on technologies you don’t know how best to use and which simply overwhelm you with information. When building your stack, it helps if you start out with some of the technologies which have a track record of success and wide adoption. If a particular solution doesn’t make sense for your organization, or seems too difficult to implement, don’t be afraid to switch it out for a different one. Martech is supposed to provide a simple solution that can easily integrate with your organization, and you have plenty of options to choose from in terms of substitutes. Your martech could become obsolete before you optimize it for your organization, so it can be helpful to begin using data they yield as soon as you adopt them. You don’t need to know the absolute best decision to make with a set of data in order to make a good one for your organization. Every incremental change you can make to your marketing efforts is a net gain which you could miss out on if you wait too long. It’s likely that you will switch out technologies anyway as new ones come online, so don’t be afraid to experiment. In order to build a stack that will streamline your marketing efforts and align with your objectives, it’s important to focus on the fundamentals of your organization. It is vital to facilitate open communication across your team. Centralize all of the data you receive on a messaging platform for your team and make sure they know how to interpret any metrics you decide to introduce. If your team doesn’t know what to expect from your new technologies, they can easily cause unnecessary confusion and stress. You will also want to make sure your team embraces change and is willing to experiment. No one knows the limits of how technology can improve marketing, and if your team is open-minded, it can make a discovery that helps your organization reach clients or improve their experience in ways you never imagined. Test out different technologies, metrics, and changes, and track results. Not every experiment will succeed, but every attempt is an opportunity to learn how to improve your organization’s marketing efforts. It’s easy to forget, but martech is there to help your content reach someone who could be your customer. It doesn’t matter how effective your marketing technologies are if you don’t have anything that can appeal to your buyer personas. You need to build your marketing efforts around the message you want your customers to receive. While it’s easy to think that martech alone can grow your company, you still need to make sure that you have content your clients want to see. The growing importance of quality customer experiences, driven by data-driven marketing, means that martech is set to only grow in importance for marketers in every industry. Marketers all over the world are turning to martech to guide decision-making and to better reach potential customers. The sooner you begin to integrate marketing technology into your own strategies, the better prepared you’ll be able to reach clients as new technologies emerge. Rather than waiting for the best martech, find ones that work and begin applying them to improve every customer interaction you can.